Scheduling a gutter cleaning appointment in Sparta NJ is one of the best things you can do for your home during fall. At this time of year, your gutters are susceptible to issues that can cause problems for your home over time. Serving upstate New York and Northern Jew Jersey, All County Window Cleaning cleans gutters and windows and provides pressure washing services. It Prevents Water Damage: Water that doesn’t escape through your gutters inevitably ends up damaging your home because it seeps through your ceiling or walls. As these areas become soaked with moisture, the wood begins to rot. Unfortunately, it’s not always evident this is happening until it’s too late. By then, all structural integrity is gone and the ceiling or wall could even collapse. It Halts Pest Invasions: No one wants to share their home with an unwelcome pest. When your gutters aren’t cleaned, they serve as cozy, moist homes for bugs like mosquitoes. Such insects could even lay their eggs in your gutters, compounding the issue. It Eliminates Leaves: During fall, leaves carpet your yard—and some can even enter your gutters and cause needless clogging. When this happens, other types of debris, such as dirt and branches, can also get caught inside. 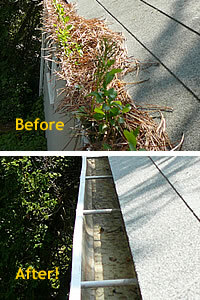 A clogged gutter is a dysfunctional gutter that doesn’t properly move water away from your home. It Stops Leaks: Water can freeze inside a clogged gutter, which places pressure on your rooftop as it presses against the shingles. This could cause roof damage and even lead to leaks inside the house. If you don’t feel comfortable inspecting the gutters yourself, call in the gutter cleaning professionals. They’ll be able to spot any existing problems that could lead to bigger issues down the road, and they’ll make sure your gutters are in great condition for the winter season. If it’s time to give your home a little TLC, get in touch with the professionals at All County Window Cleaning. In addition to inspecting your gutters, they can also provide any necessary roof treatments and window cleaning. For more information on our gutter cleaning services at (973) 827-8311.